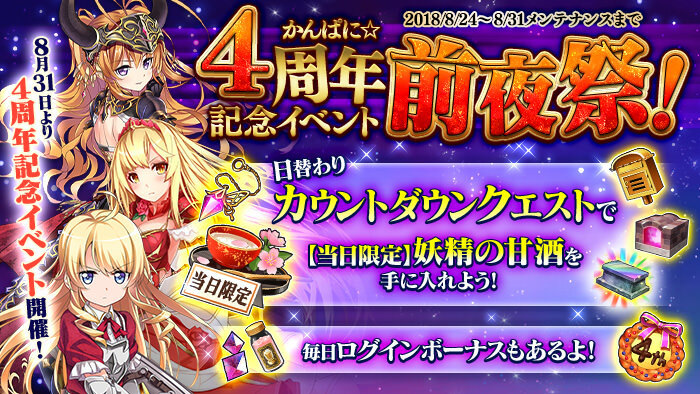 ▼ [4 Year Anniversary Commemoration Event Pre-Festival Quest] appears! During this period, a commemoration countdown with the [4 Year Anniversary Commemoration Event Pre-Festival Quest] will occur every day! Upon clearing the quest, you are guaranteed a [Limited] Gold Postbox and [Daily] Fairy's Sweet Sake, each day. Each time you clear the quest, you will receive one item from the Rare Items list until the quest disappears. ※ Quest will change every day at 00:00, and the first clear reward will reset. ※ The [Limited] items from this campaign will expire with the 9/14 (Fri) maintenance. Last edited by Folseus; 08-25-2018 at 02:05 AM.